Risus sardonicus or rictus grin is a highly characteristic, abnormal, sustained spasm of the facial muscles that appears to produce grinning. 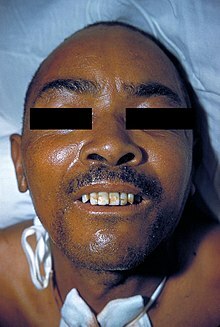 Risus sardonicus may be caused by tetanus, strychnine poisoning or Wilson's disease. The name of the condition, which has its roots in the Mediterranean island of Sardinia, derives from the appearance of raised eyebrows and an open "grin" – which can appear sardonic or malevolent to the lay observer – displayed by those experiencing these muscle spasms. It is most often observed as a sign of tetanus. It can also be caused by poisoning with strychnine or Wilson's disease. In 2009 scientists at the University of Eastern Piedmont in Italy wrote that they had identified hemlock water dropwort (Oenanthe crocata) as the plant historically responsible for producing the sardonic grin. This plant is the most likely candidate for the "sardonic herb", which was a neurotoxic plant used for the ritual killing of elderly people in pre-Roman, Nuragic Sardinia. ^ "Tetanus". World Health Organization. ^ Bryson, Peter D. (1996). Comprehensive Reviews in Toxicology: For Emergency Clinicians. CRC Press. p. 791. ISBN 978-1560326120. ^ G. Appendino; F. Pollastro; L. Verotta; M. Ballero; A. Romano; P. Wyrembek; K. Szczuraszek; J. W. Mozrzymas; O. Taglialatela-Scafati (2009). "Polyacetylenes from Sardinian Oenanthe fistulosa: A Molecular Clue to risus sardonicus". Journal of Natural Products. 72 (5): 962–965. doi:10.1021/np8007717. PMC 2685611. PMID 19245244. This page was last edited on 20 January 2019, at 11:19 (UTC).